Brightcove Professional Services does a lot of work with Sun in support of the superb ChannelSun offering. It's one of the most ambitious enterprise video experiences we've seen, let alone helped to build. It has live features that are still sitting in requirements docs at major media companies, and traffic that would make some of them jealous. Some of our team is planning on attending JavaOne this year, the first week of June in San Francisco. In researching the conference we stumbled upon a JavaOne contest - "Dude, Where's My Pass?" 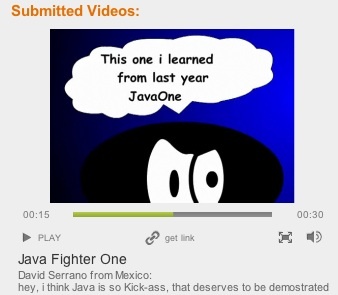 Submit a video and you have a shot of saving a few grand on a JavaOne pass and travel. I "sat down" with Greg Posten, who leads the video initiative on Sun.com, to learn more about the new user-generated video contest. Greg and team used Brightcove's turnkey user-generated video tools to accept and moderate submissions for the contest. The submissions were then used in a standard Brightcove player, and cross-posted automatically to the main video hub Channel Sun. Eric: Sounds like a low investment, but is there a way to measure the ROI on the project. Greg: It certainly wasn't one of our more costly programs : ) For this project the ROI for us is really measured in the number of entries we receive. JavaOne is really about engaging with our partner and developer communities and this program is really designed to help foster more community around the conference. It also gives us access to some great content from around the globe, so far we've had entries from India, Germany, Columbia, Egypt, Russia, Brazil, Sweden, Australia, UK, Netherlands, Mexico, New Zealand, Tunisia and of course right here in the US. Video does such of great job of allowing people to engage with each other, since you get to see and hear what these folks have to say. A whitepaper or essay just doesn't convey the same personal message. Eric: Is this integrated in any way with Channel Sun? Eric: Speaking of JavaOne, what video coverage do you have planned for JavaOne in June? Greg: Well, let's just say our team is going to be plenty busy. We will be broadcasting live several of the CommunityONE session tracks starting on June 1st. We will also be broadcasting live general sessions on all four days of the JavaOne conference. Of course, if you miss any of the live sessions they will be available as on demand content on ChannelSun. There will also be a ton of podcasting and video content from the show floor. It's going to be a really busy, exciting week. Thanks to Greg Posten for the quick interview. We wish you lots of luck for a successful JavaOne this year - and look forward to seeing you there.